Very Clean. 2 axle custom trailer, Clarion 250 watt custom stereo with cd and four speakers, automatic bilge pumps, docking lights, dual batteries with switch, bimini top, 2 built in coolers, rotating passenger seats with flip up bolsters, U-shaped seating, removable table, snap out carpet, full canvas, full size spare, boat in "new" condition. 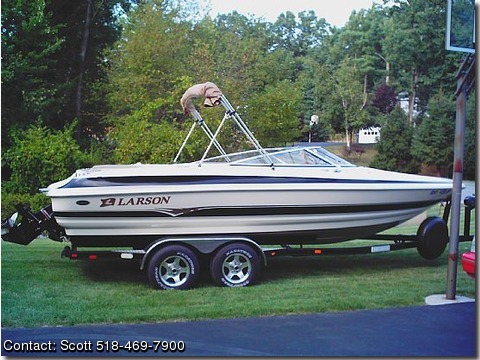 This boat is well maintained and in excellent condition. Includes two pairs of skis, 2 anchors with ropes, dock lines, 6 boat bumpers, two towables and 8 life vests. This boat is rated for 11 adults - plenty of room for all.